Is the light in your refrigerator ever the light at the end of the tunnel after a long day? If so, let that light shine bright on Trader Joe's Reduced Guilt Spinach & Kale Greek Yogurt Dip. Not only is this dip packed with protein, but it's also low in calories. As the 'reduced guilt' name implies, only 30 calories per 2 tablespoons, compared with hummus at 80 to 100 calories, your snack before dinner just got a whole lot thinner. PLUS, this dip is jam packed with antioxidant greens Kale and Spinach! This is a definite addition to your Trader Joe's List. 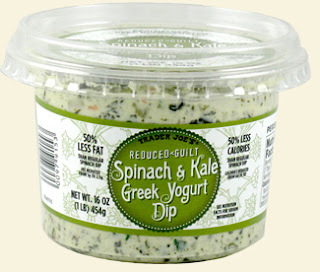 Get nutrition facts for Trader Joe's Reduced Guilt Spinach & Kale Greek Yogurt Dip. Call me skinny because I'm addicted to Trader Joe's Reduced Guilt Spinach & Kale Greek Yogurt Dip. Picture taken from Trader Joe's Website. LOVE the move towards reduced-guilt options, but I'm not personally a huge fan of this dip. How about making a reduced-guilt hummus? I tried this dip this weekend and love it! I am surprised because I don't care for Kale. Great guilt-free snack!! I love this dip! The only problem is all the Trader Joe's in my area are out of stock!! I love it!!! I use it in my tuna salad. No more mayo, I just add my tuna fish to the dip and it has veggies and good flavor! What is the best cracker to go with this dip?